NRMCA publishes a series of publications called Concrete Sustainability Reports designed to provide guidance on how concrete meets green building objectives. Some of the most popular in the series are centered around how concrete contributes to LEED. CSR01 and CSR11 provides a detailed description of how concrete can contribute towards LEED 2009 and LEED v4 certification respectively. Because of concrete's versatility there are many applications where concrete can be used in a building project, from foundation and superstructure to sidewalks and parking lots. That makes concrete unique in that it can contribute to every credit category in LEED. Examples of how concrete can be used to influence points in LEED are presented and a table summarizing how concrete contributes to each credit is provided. NRMCA sponsored a project to help NRMCA member producers meet the requirements of LEED v4 by providing producers with an industry-wide EPD in accordance with LEED v4. A cradle to gate Life Cycle Assessment (LCA) for ready mixed concrete was conducted and an industry wide (average) EPD was produced. The LCA and EPD encompassed concrete for a variety of applications, strengths, durability classes and slumps (or slump flows), and regions so that a producer can use the industry wide EPD during the submittal process for a project requiring an EPD. The EPD represents concrete typically used on a variety of projects including residential, commercial and public construction in different climate zones and in different markets. For the EPD to meet the requirements of LEED v4 for submittal on a project, a concrete producer must have participate in providing data to the LCA and be listed in the EPD. A list of participating companies and plants is included in the appendix of the NRMCA Industry Average EPD. Click here to download the NRMCA Industry-Wide EPD. 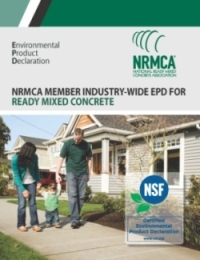 Using data collected in developing the NRMCA Industry-Wide EPD for concrete, a set of industry benchmarks (industry averages) for key environmental impacts was developed for the national level and eight NRMCA regions. The benchmarks represent the environmental impacts of products with varying strengths for different applications and exposure conditions. Concrete producers can use these benchmarks to compare their environmental impacts to those of the industry baselines to determine if theirs are lower. This allows concrete producers to participate in Option 2 of the LEED v4 MR Credit on EPDs. Click here to download the NRMCA Life Cycle Assessment Benchmark (industry average) report. Click here for more information on NRMCA sustainability resources. For additional resources available from NRMCA partners click here.